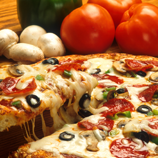 If you want to enjoy the taste of the real Italian cuisine, Lucio’s Pizzeria is the place you’re looking for. For more than twenty years the Rocca brothers have brought from Italy to Pleasantville all the original and genuine taste of the most loved cuisine in the world. Cordiality and a nice atmosphere will be the perfect toppings for any delicious plate you want to order. You can’t find any other pizza that can compare to the one you can find here because, as everybody knows, Italians do it better. Now, you can also save it a bookmark icon on your iPhone and iPod Touch.